Free Shipping on All Orders Over $499! Many thanks to ericesterl for his exellent product review. 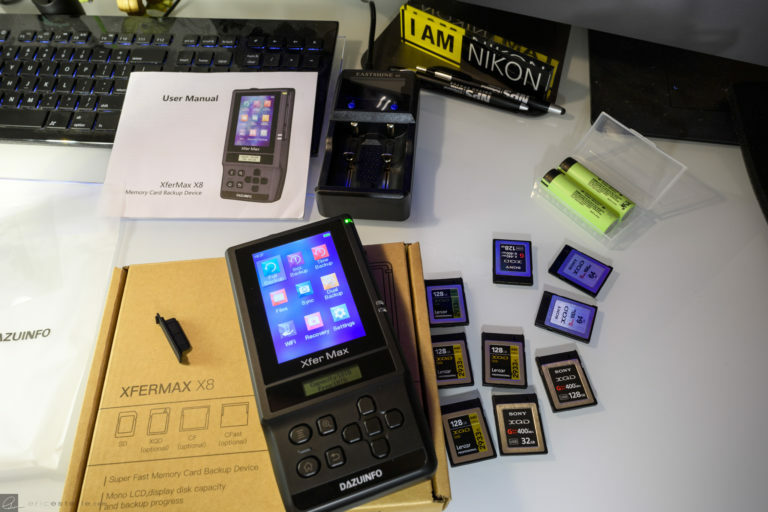 Thanks to the awesome folks at Dazuinfo, I was recently sent one of the only XQD/CFast field backup devices that just hit the market, the XFERMAX X8-S (PDF) made by DazuInfo (https://www.dazuinfo.com). I will be doing an in-depth review on it once I’ve had more time using it in the field. It will be coming with me on my expedition in a few months to hit the 7th continent, Antarctica (and last for me to have been to all 7). Being able to back up in remote places is absolutely critical for me. This capability is something that I’ve needed for quite some time, so much so that I was contemplating trying to create my own embedded Linux device to accomplish this task. Now, I don’t have to! When this device arrived a few days ago, I put my 2TB Samsung Evo SSD drive in. Since then I’ve used it for transfers in the field, but also as a substitute for always having to have a laptop with me when I travel. The device uses 2x3400mAh rechargeable batteries. It has built-in card slots for XQD, CFast, and of course SD. A couple people have mentioned why not use something like the Western Digital My Passport Wireless SSD and while I wanted to like the WD My Passport Wireless SSD, I have several issues with it. Below are a few reasons why the DazuInfo’s XFERMAX series are superior. While the WD does have good battery life, everything in it is proprietary and inaccessible. 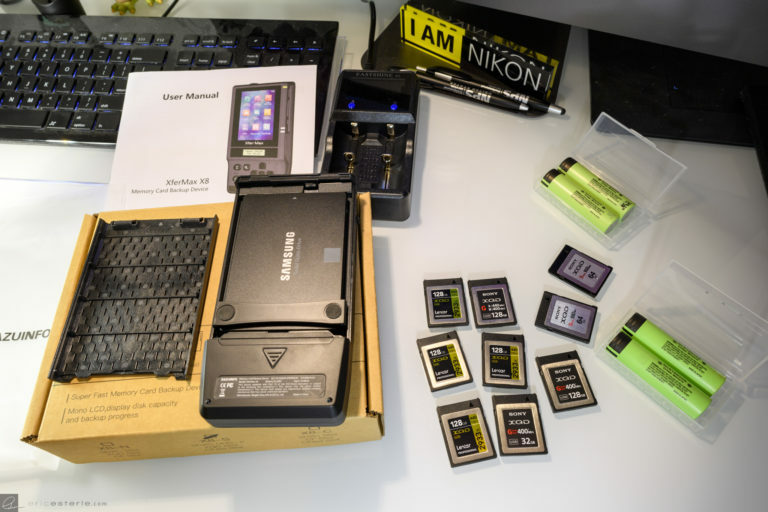 For example, you can’t easily replace the batteries with fresh Lithium batteries and you certainly can’t easily swap out the hard drive. This has always been a point of contention for me, and why I won’t buy Western Digital products to this day. I used to have several WD Thunderbolt RAID drive units, but they won’t work with any drive other than a WD drive. One of the ways this WD device reaches its claimed 10 hour battery life is by not having a built-in LCD forcing the user to interface with it via a cell phone/tablet and the WD App. The 3 biggest things I dislike about the WD is 1) it doesn’t have an XQD card slot built-in requiring another piece of tethered gear, 2) Requiring another device to interface with it which means another piece of gear and the WD App, and 3) most importantly you can’t easily access the drive and battery to swap either out thus limiting backup capacity. The X8-S solves all of those problems while being smaller. 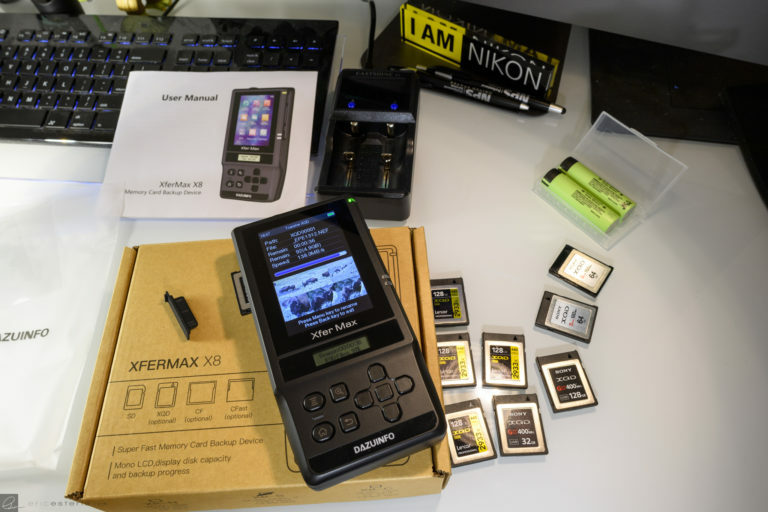 The X8-S has removable batteries, a removable hard drive, both of which are extremely easy to access and it comes with an LCD to interface the device with and a built-in XQD/CFast card slots all without any other gear required. The other thing I don’t like about the WD is that for MAC users, it requires they install Paragon NTFS for MAC to attach the drive as a mass storage device. This may possibly be worked around via formatting it HFS+, but I’m not sure if that will work as WD requires Mac Users install Paragon NTFS for some reason. The X8-S is simply formatted exFAT which is universally supported. In a nutshell, it really depends on end-user needs and the WD is marketed as a “Wireless Drive” which requires a phone/tablet and for me it would also require an external XQD card reader. The X8-S transfer speeds from card to drive are also about double what the WD’s are. I don’t need any of the proprietary challenges of the WD or any of its “media streaming” capability. I only need an intuitive and openly accessible XQD/CFast backup solution that doesn’t require other gear to function. As the Black Magic Pocket Cinema Camera 4K units are starting to hit the market, having a CFast solution in addition to XQD is amazing. Also, if you’re a Canon 1DX mkII shooter, the CFast card slot is much needed. I’ve only just begun to use this device, but color me impressed! 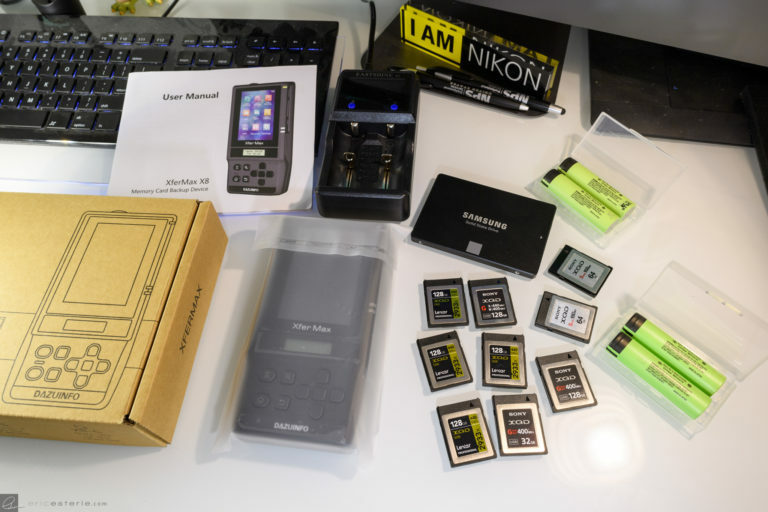 I plan to also compare this unit with the GnarBox as well, but again no XQD/CFast slot and you need an App to interface with it for full functionality. So yeah, I’m definitely partial to the XferMax X8-S for those reasons alone. Here are a few photos of setting it up for the first time.